Project Description: Re- needed an ecommerce site that helped them bring their product selection of unique products to a wider audience range as well as helped spread the word on their eco-friendly message. The main issued faced by the client was how to display their range of colorful and unique wares while still making it appealing to the online shopper. Working with Six Demon Studio, we implemented a design that took a minimalistic approach so that the color, designs and overall style of their products could be the star of the show. They couldn’t have the lime light all to themselves, however. They had to share with Re- good will ambasador, Henre- etta. 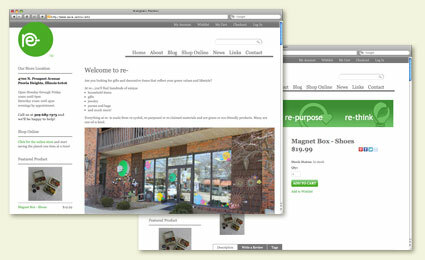 The message of Re- is just as important, if not more, than their online catalog. The answer to the project goal of helping Re- spread its message was the inclusion of a blog into the framework of the site. This blog will feature articles by the owner, Nancy Martin, who is extremely knowledgeable in the industry of repurposing & recycleing products as well as a strong "fair trade" advocate. In addition to blogs by Nancy, Henre- etta will also have her own column on the blog to speak on a range of topics. Finally, a news section was added to the site for the inclusion of past company news letters as well as information on Nancy’s upcomming speaking arrangements. We’re quite proud of this design and the relationship we’ve formed with Re- during the course of this project.